Why does it cost nonprofits on average $20 to raise $100, while it costs companies only $4? Simply put: Nonprofits have no leverage. No one has to make a donation. And since most donors have no direct stake in the organizations they support, they make donations out of the goodness of their hearts. If donors feel like writing a check, they will. If they don’t, they won’t. 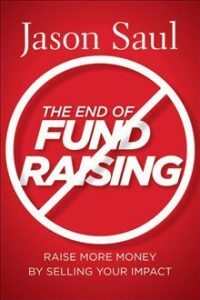 The End of Fundraising turns fundraising on its head, teaching nonprofits how to stop begging for charity and start selling impact. For the first time, nonprofits have economic power. We live in a new era where consumers, businesses, investors, employees, and service providers attach real economic value to social outcomes. An era where yesterday’s „feel good“ issues—education, the environment, health care, the arts, and animal rights—now have direct economic consequences and opportunities. Nonprofits now have leverage. To use this leverage, nonprofits must learn how to „sell“ their impact to a new set of stakeholders. The End of Fundraising includes the tools needed to effectively frame, market, and sell a nonprofit organization’s impact, and contains step-by-step guidance for creating dynamic new opportunities with a variety of funders.